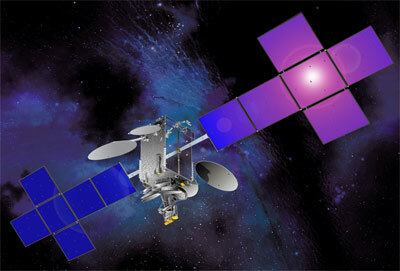 SES NEW SKIES ordered in February 2008 the NSS 14 satellite from Space Systems/Loral (SS/L). It will be the largest satellite ordered by SES so far. In early 2010, the satellite was renamed SES 4. SES 4 is a hybrid satellite featuring 52 × 36 MHz equivalent C-band transponders and 72 × 36 MHz equivalent Ku-band transponders, a substantial increase in the total capacity available at 338 degrees East The state-of-the-art spacecraft has been specifically designed for its orbital location, with C-Band beams serving the eastern hemisphere of Europe/Africa, full America's coverage as well as a global beam to support mobile and maritime customers. Four high power, regional Ku-Band beams will provide service to Europe/Middle East, West Africa, North America and South America with extensive cross-strapping between C- and Ku-band transponders providing enhanced connectivity. Government applications will benefit from sophisticated command encryption. The satellite is based on the SS/Loral SSL-1300 bus and is equipped with an ion propulsion system ensuring a minimum life of at least 15 years in orbit. At a launch weight of 5800 kilograms, SES 4 is compatible with all relevant launch vehicle providers. SES NEW SKIES deployed SES 4 over the Atlantic Ocean region at 338 degrees East, enabling the incumbent NSS-7 satellite to move to a new orbital position.